SPOILER ALERT: If you keep reading, you can’t whine about me ruining any surprises later. John, why is there an Iron Throne in our flat instead of my chair? And our those brain’s Molly is eating? Along with making Dr. Who “darker” in this incarnation, Moftiss now warns that Sherlock will follow suit, and there’s more indication that there will be little left of the spirit of the actual Sherlock Holmes stories left. Gatiss recently revealed that the new episodes of the show will feature ‘tragedy’ leading many to speculate that Mary Watson would meet her end. “You can always expect tragedy as well as adventure, that’s just how it goes,” he told the Radio Times. It may seem a little too early to axe her considering she was only just introduced in series three in January, but it’d certainly pack the emotional punch Gatiss teases. Freeman himself suggested Mary will die at some point. — news that Season 4 will have feature more Moftiss women is hardly encouraging. I’ve got to say that the most recent comments coming out about Season 4 and the Christmas special is makes me fearful of what they are doing to one of my favourite Sherlock Holmes and Christmas stories. I read “The Adventure of the Blue Carbuncle” or watch the Jeremy Brett version annually during my run up to Christmas, and the thought of it be turned into an inchoate “darker” mess depresses me horribly. As I’ve mentioned before, it’s the most uplifting and heart-warming of the Sherlock Holmes stories, no one dies (except the geese), no one goes to prison (not even the thoroughly remorseful thief), the conscientious commissionaire gets the magnificent reward, the drunken scholar gets his goose and his hat back, and the poor falsely-incarcerated reformed crook is returned to the loving arms of his family for Christmas. It makes A Christmas Carol tawdry in comparison; only Humphrey Bogart, Aldo Ray, and Peter Ustinov in We’re No Angels can compare. Just kill me now. No, seriously. KMN. 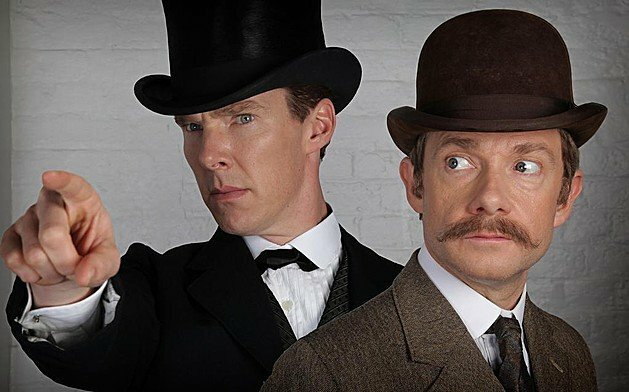 I fear that the BBC’s originally brilliant updated adaptation of Sherlock Holmes is devolving into a race to the ultimate in social media pandering and trendy mash-ups of recycled popular tropes. (No, no, don’t hold back. Tell us how you really feel.) 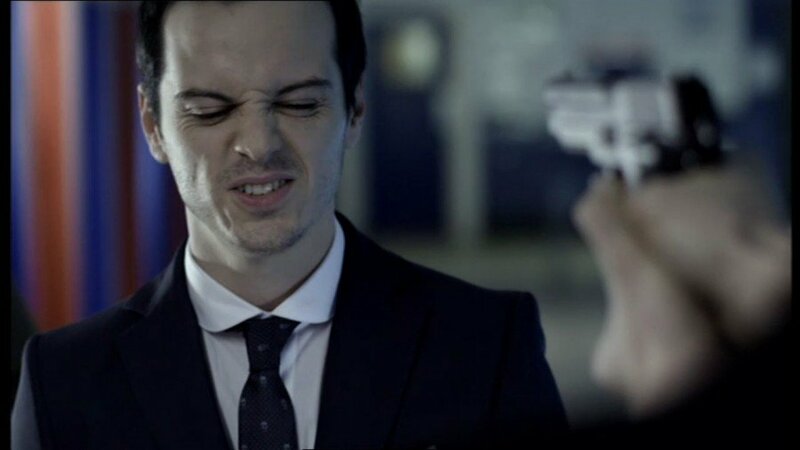 I won’t be at all surprised to find out that Moriarty returns as a zombie; The Adventures of Sherlock Holmes and Zombies. Hey, it worked for that guy who recycled Pride and Prejudice. This entry was posted in Captions, News, Speculations on November 26, 2014 by JH Watson. I had to tell you I agree with everything you said in this post…after two brilliant series, series 3 was…well, you know what I think; we’ve talked about it before. I don’t like “Elementary” anymore, either. The next person I think they should bring on that series as a regular is a shrink, because every character there obviously needs one! I think Moftiss’s motivation has gone from creating a loving update of a revered genre in a brilliant way to a desire to shock the hell out of their audience whether it’s logical to do so or not. (I’m not even counting on Mary getting killed because it’s sort of expected.) And sadly, the squeeing fangirls will encourage them in this by cheering no matter what they’re served with. I’ll also will catch the Christmas Special Sherlock, but I’m not going to go to any extra trouble or expense this time, no month and half of catered Sherlock Viewing Parties with a brand new 51″ plasma TV and a month of cable plus VPNs and scrambling to get the immediately-after-BBC-showing-downloads. I suppose it’s a Good Thing that both Sherlock and Elementary lost their mojo at this time since I have some serious work I have to focus on this year. I do plan to get some reviews of some of the Sherlock Holmes pastiche and non-fiction posted when I get time, but I haven’t the heart to do any fan fic, art, or video. Elementary kept improving and then would dig itself further into The Piteous Pit of Melodrama, then start to pull itself out, then grab a shovel and dig deeper, recover a little ground… until finally it just got a backhoe and started excavating to the core of WTF? Watson’s taking on a Drug Queen, Sherlock is playing James Bond solo (at least Holmes had Watson for “His Last Bow”), Mycroft is I don’t know what, Lestrade is Caspar… a big pot of stewed okra is more appetizing. Well, never mind. We’ve got some lovely episodes and performances we can re-watch, and some iconic images. I have high hopes for some good Sherlock Holmes pastiche novels and there’s always the Canon to re-read. Best wishes for 2015! May your year be filled with joy, love, peace, and prosperity! Are you going to review season 4 now? please do it I love your reviews. Thanks for the kind words. I haven’t seen Season 4. I have not even read any fan reviews, though a friend did tell me she was underwhelmed and confirmed two of my guesses as to what happened in episode 1. I do have a recording of the episode, but I’ve not been inclined to watch it given the condition of the world right now (including the Brexit and U.S. election votes). I suspect this will be the last season until Freeman and Cumberbatch decide they need the money and some suit at BBC wises up. Though by then, there will probably not be a PBS in the U.S. any longer and any corporate suit who is looking for a surefire nostalgia success will want to reboot with younger actors (yes, I am depressed and despondent over the political and social climate, and the descent of Sherlock into soap opera Shock schlock). I’m hoping to work my way through some Sherlock Holmes pastiches, though there are too many to complete and too few good ones to recommend. Still I hold some hope that we’ll return to something resembling civilization and good taste in my remaining lifetime, so keep calm, carry on and maintain the stiff upper lip.